Since 1868, Swab Wagon Co., Inc. has been producing quality vehicles at our plant in Elizabethville, Pennsylvania. From farm wagons to fire apparatus, Swab has continued the culture of innovation developed by our founder, Jonas Swab, almost 150 years ago. Today, Swab produces a wide range of custom truck bodies for fire emergency, medical, animal transport, commercial and municipal uses. Swab also specializes in repair and modification work for all types of fire and rescue bodies as well as antique fire apparatus preservation and restoration. For over forty years, we have been producing fiberglass bodies for a variety of applications, but in 1996, we developed the ALSF-96, now known as the PIONEER SERIES. 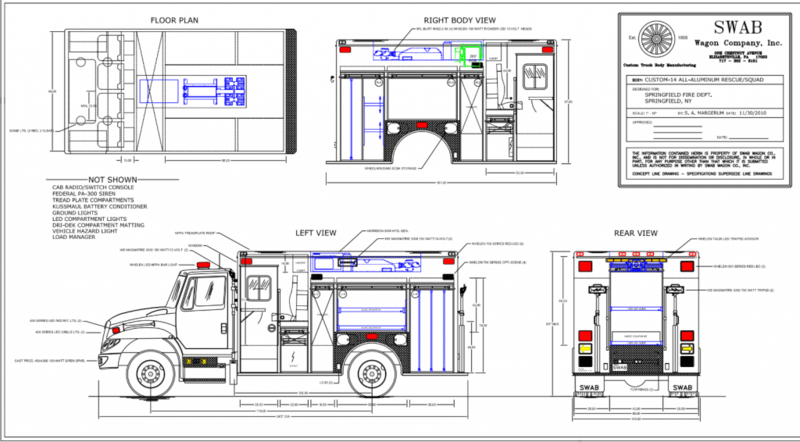 With ten different floor plans and available with variations on some, the Pioneer Series has proven to be extremely versatile for emergency and quick response units. Its user friendly compartments provide readily accessible storage for all types of equipment- all stored at waist/chest height. Since our first squad truck in 1937, Swab Rescue Bodies have become renown for their quality of construction, innovative designs and complete customization, and longevity of service life. All Swab Rescue Bodies feature tubular aluminum or stainless steel frame construction. This tubular body skeleton sets Swab bodies apart from the competition. The best part? All Swab Rescue Bodies are easily transferable to new chassis. The Swab Skidder series is medium duty utility bodiy designed for maximum payload and efficiency. These lightweight units are ideal for emergency response teams that carry heavy loads of varying equipment. With available custom body dimensions and compartment set ups, your Swab Skidder will be as unique as your organization. Say hello to your dream truck. For over 50 years, countless humane societies and animal agencies have relied on our solid fiberglass animal transport vehicles for their durability and humane treatment of animals. We offer two models of our Animal Rescue Fiberglass (ARF) body. Both models come with a hefty package of standard equipment and are available with a wide range of options for you to build your perfect truck. All Swab animal transport units are easily transferable to other chassis. Best of all, Swab animal transport trucks are designed with the humane treatment of animals in mind! Our Specialty Police Units offer law enforcement agencies the same customization, quality, and attention to detail as our heavy-duty fire apparatus lines. We have built units for Homeland Security, Crime Scene/Evidence Collection, S.W.A.T. Teams, Bomb Squads, Accident Reconstruction Teams, and Counter Terrorism Units. However you protect and serve, the Swab Police unit is up to the task. The Swab M&O Series are heavy-duty utility vehicles designed for the toughest work that's thrown your way. With a similar construction to our Rescue line, applications vary widely and can accommodate any industry’s heavy-hitting needs. The trucks are entirely customizable, so the sky’s the limit for their size, setup, and options. Whatever your work throws at you, the Swab M&O is the ultimate workhorse. We offer complete remount and refurbishment services for all makes of fire apparatus. We perform all nature of structural, electrical, and cosmetic work. Its time to turn that dream project into a reality. We specialize in the restoration and preservation of antique fire apparatuses. We offer all levels of restoration from touch-up cosmetic work to full, frame-off restorations. We also offer pump and valve rebuilds. Let's finally finish that project. Swab Wagon Company is pleased to announce that we are a COSTARS-13 Emergency Responder Vehicle contractor for all Pioneer, Skidder, Champion, Commander, TB Tanker Bodies and PB Pumper Bodies. We are also a COSTARS-25 Municipal Work Vehicle contractor for all ARF-95 Fiberglass Animal Transport units, ARF-6V Animal Transport Van Units, and all M&O Special Operations custom work trucks!